Prior Scientific has introduced accessory mounting wings for its popular H117 stage for inverted microscopes enabling simple and precise integration of tools such as microfluidic pumps, micro-injectors, micromanipulators, probes and sensors. The H117 range of stages from Prior Scientific is built for performance, efficiency and for obtaining the very best data possible. Fully compatible with inverted microscopes from Zeiss, Olympus, Nikon and Leica and offering a travel range of 114 x 75mm, a maximum speed of 50mm/sec, repeatability of 0.2 µm and an average metric accuracy of approximately 0.05µm/mm. The H117 offers unmatched fast, precise and accurate positioning of samples without the need for encoders. 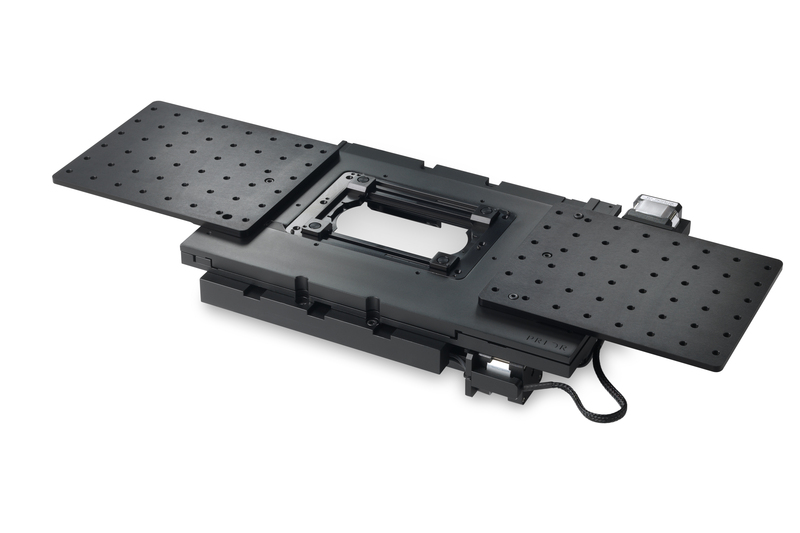 The H117 microscope stage is controlled via ProScan III control system which provides a flexible, high performance control system for Prior microscope accessories including motorised stages, focusing devices, filter wheels, illumination devices, shutters as well as robotic sample loaders for well plates and slides. ProScan III is designed to be versatile and simple to use, yet capable of automating complex microscopy applications that demand the very best in precision and accuracy.